Zap is the strategic technology brokerage solution developed by ZapLabs (formerly ZipRealty) that is being rolled out to all of the Realogy brands. Metro Brokers' COO Craig McClelland says ZapLabs hit the bull's-eye on delivering a great solution to cover the needs of 80 percent of what agents need. The Zap platform is the strategic technology brokerage solution developed by ZapLabs (formerly ZipRealty) that is being rolled out to all of the Realogy Franchise Group brands — ergo, 250,000 real estate professionals. 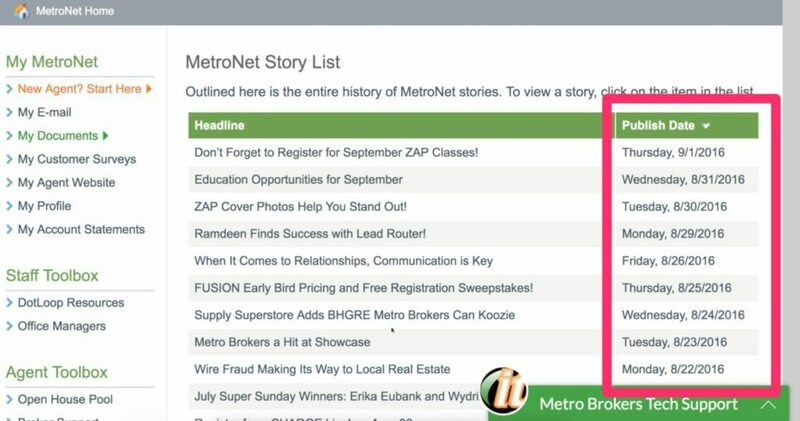 I was surprised by the Metro Brokers announcement that it was launching Zap this early in the rollout. 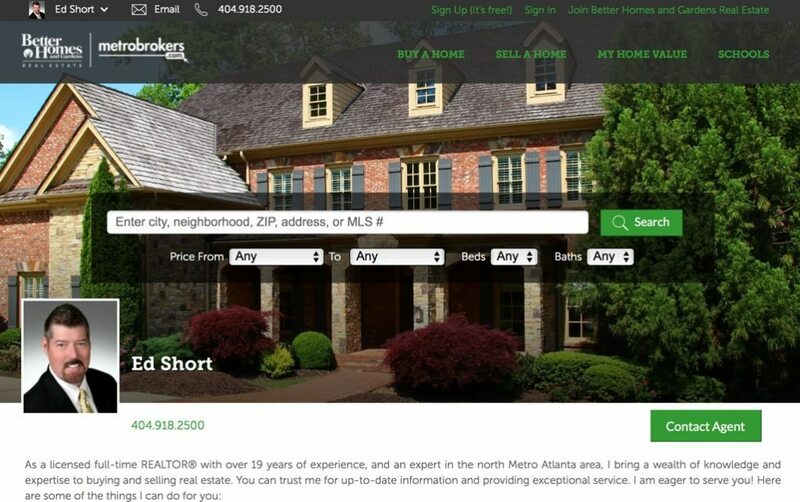 Metro Brokers is a huge Atlanta brokerage firm with 1,930 agents and 25 offices, making it the largest Better Homes and Gardens Real Estate franchise by agent count. It is also a high-volume company, processing 7,800 transactions a year (100 percent on dotloop), which ranks the brokerage just outside of the top 50 in America, and second among BGHRE firms behind Gary Greene. Aside from size, Metro Brokers owns a technology company. The leadership of the firm own a company called Brytecore, a broker technology platform that includes the broker website, agent websites and back-office solutions. Realogy CEO Richard Smith is focused on making Zap successful for relocation. Brytecore is an advanced solution that we have reviewed as a game-changer for large firms. Some of the key factors that influenced the decision to go with Zap have to do with Metro Brokers’ platinum status as a principle broker in the Cartus network. Realogy CEO Richard Smith is keenly focused on making Zap particularly successful for relocation, and a common platform for servicing clients is an important element of delivering a high-quality, uniform service. As you can see from the screen shot below, Metro Brokers was an ideal place for Zap to have a successful rollout. Metro Brokers has created a center of excellence around agent communication and training. This is the home screen, where agents log into Metro Brokers. You can see the commitment to Zap awareness, education and training. Every brokerage firm can take a cue from this intranet. It’s visually awesome and content-rich. All of the important tools are a link away — email, documents, dotloop, agents’ websites and so on. The feature is the cadence of publishing information to the agents. Look at the publish dates and headlines of the stories that they push to their agents each and every day. Every brokerage firm can take a cue from . @MetroBrokers’ intranet. There are some announcements, but a lot of the stories are highly useful training reminders that develop agents. This quality of support and engagement, combined with their technical acumen, allowed Metro Brokers to plug in the Zap onboarding strategy to pre-existing infrastructure and engagement with agents. They did not start from scratch. The timeline for rolling out Zap started in July. 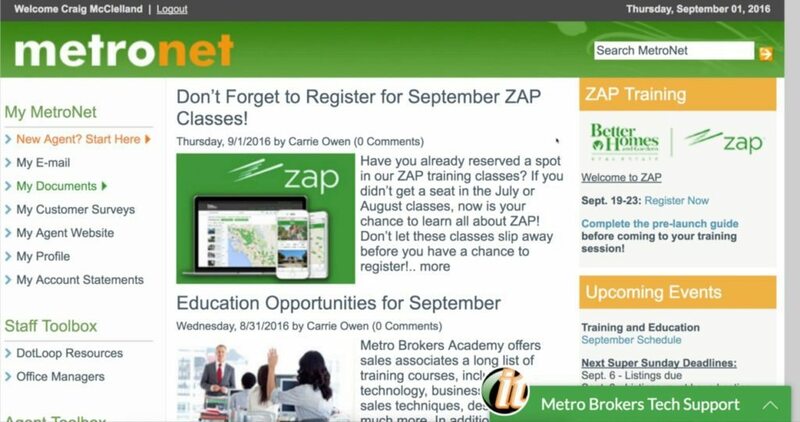 Metro Brokers worked with the Zap Deployment Team to create all of the training and FAQs for the launch. Before agents could take a class, they had to watch 11 videos about Zap and pass quizzes that showed their progress. The only incentive was to get accepted into the class. Since July, more than 600 agents have been through the Zap training. A lot of the training materials are in the Be Better University, a learning management system offered by BHGRE. The timeline for rolling out Zap started in July. 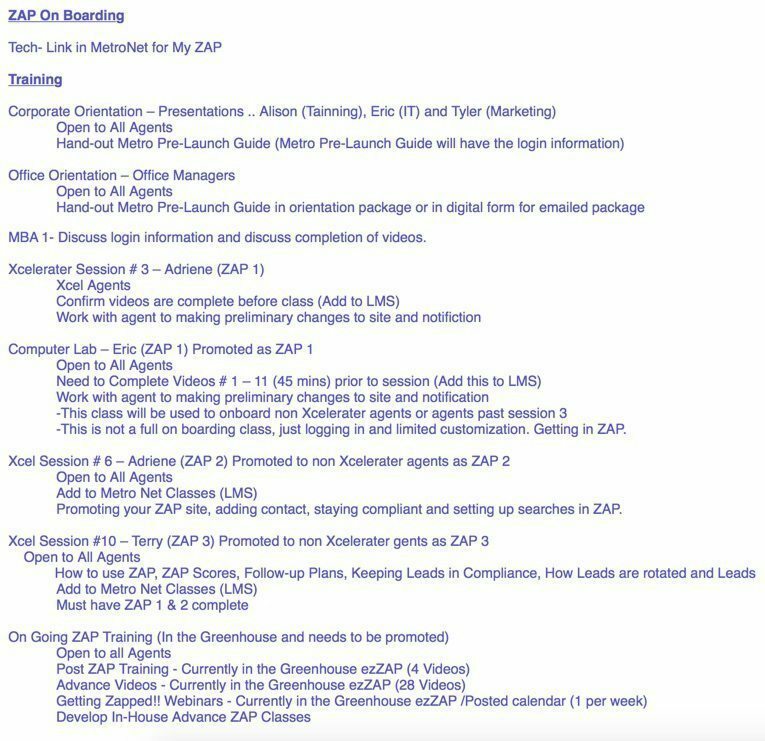 McClelland had high praise for the Learning Guide supplied by ZapLabs and gave the overall training program a B+ — which is pretty good for a brokerage operating at this level of sophistication. McClelland shared the onboarding plan that they use for Zap. McClelland gave us a tour of the Zap platform. The opening dashboard is what you would expect. The dashboard focuses on task management and follow-ups, like all good CRM solutions. The training and product news feed is on the right-hand side. The left-hand rail is used for navigation and includes Contacts, Business, Manage, Reports (coming), ZapStore, Quick Links and Support. Notice the guy in the lower right-hand corner? That is Colin, a real human being who works with BHGRE brokers to stay connected to the agents when they are online and help them through any rough points. A cornerstone of the Zap platform is the ZapScore — a client rating algorithm that emphasizes customers who are hot prospects. 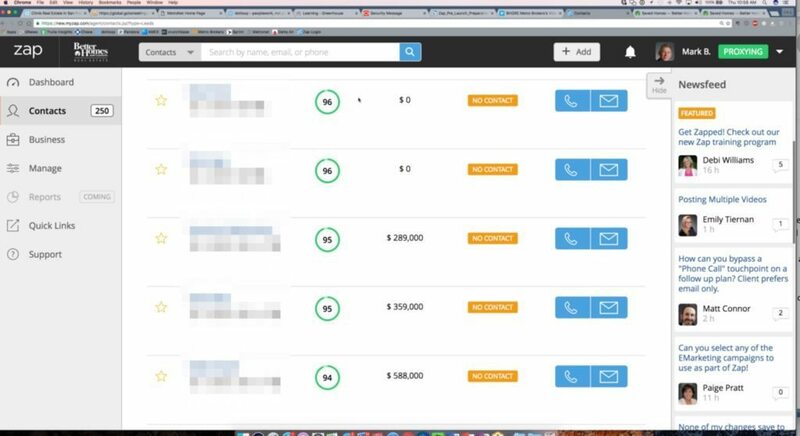 When agents select their contacts button, they are able to sort customers by the ZapScore to focus their attention. A cornerstone of the Zap platform is the ZapScore — a client rating algorithm. McClelland indicates that it takes a few data points before the ZapScore really kicks in to be effective, but he said the agents love it and feel that it has a lot of value to them. Another feature of the Zap platform includes the follow-up features that are material to every good CRM platform. They include phone scripts, email scripts and campaigns. The scripts are already loaded into Zap, but brokers and agents have the ability to add/edit as they like. The lead management section notifies the agent by text message and phone call when a new inquiry arrives. The Zap Store is the place of great opportunity for Realogy. This is the technology store where Realogy aligns with multiple vendors and gives the brokerage the ability to integrate and promote those recourses to their agents. The Zap Store is developing, and it is still in beta. But as you can see from this short sampling, there are already a number of great applications that you can plug into Zap including ZapLeads, Zillow, xpressdocs and the Innovator Award-winning Cloud CMA. They are nicely designed, responsive to all browsers and provide agents with the freedom to select background images that match the market that they target. They are IDX websites, not Virtual Office Websites. The brokerage has the ability to associate multiple MLSs to the search and to narrow the service areas and lead coverage areas to ZIP codes that are appropriate. With Zap, the brokerage has the ability to associate multiple MLSs to the search. The agent also can leverage vanity URLs to drive additional traffic or redirect current traffic to the site. 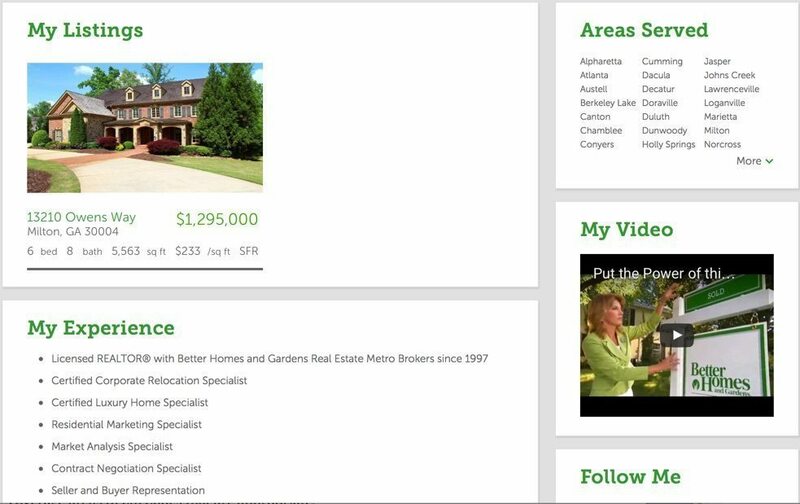 Below the fold of the home page, the agent’s listings are featured along with the areas they serve, their experience and their personalized videos. There is a balance between providing content-curating flexibility to the agent without overstepping the elegant and clean layout. Zap is pretty new, so it is not entirely fair to complain about the shortcomings of the application. Overall, McClelland says they hit the bull’s-eye on delivering a great solution to cover the needs of 80 percent of what agents need. Victor Lund is a founder of the real estate consulting firm WAV Group. Follow him on Facebook or LinkedIn.